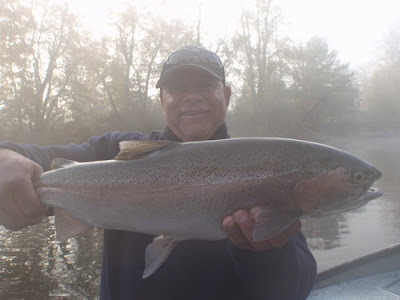 We are catching a few Steelhead each day and with any luck we will get a much needed shot of rain with a push of Fall Chrome to follow. I will be targeting Steelhead in the mornings as long as we keep having some success and I have anglers willing to look past the Salmon for a few hours of their day, once we get the first good push of Steel we will switch over to all Steelhead all the time!! Brian with a beautiful Steelhead from the early morning.